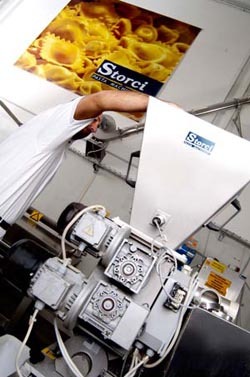 From the development to the production of dry pasta large capacities presses, to the researches carried out in the technology sector for dry, fresh, pre-cooked, instant, gluten-free pasta, ready-meals and couscous: Storci is increasingly investing in innovative projects. The R & D Laboratory has been created in its new headquarters , equipped with machinery, devices, and state-of the-art analysis tools. Thanks to the great activity of the highly qualified staff, it has been recognised as a highly qualified Laboratory for the Industry research, by the Ministry of Education, University and Research (MIUR). If your main goal is the constant improvement, even for existing machines, come and visit us and test the functioning of the new technologies. Testing your new machinery just assembled in our workshop with the help of Storci’s R&D team. Streamlining and seeing the results for yourself is incomparable! It frequently happens that the new investment needs assistance not only during the study phase but also after assembly has been made: our R&D experts are at your disposal to reach you at the end of the testing phase, to try out new raw materials and new parameters. the University experts, pasta professionals and internationally renowned pasta makers get together to exchange information about pasta, both technological and qualitative/organoleptic aspects. Among the collaborations, we can mention Parma University, Degree Course in Food Science and Technology and Degree Course in Mechanic Engineering. From theory to practice and viceversa: the lab is supported by a well-equipped room with conference-call systems and all that is necessary for a training course. The training is organized in-house by Storci’s experts, with the support of illustrious professionals of this sector.